Leprosy was a terrible skin disease. It was infectious. This means it could spread from a person to others, and they also would have the disease. There were strict rules which a leper had to observe. The person had to live outside the camp away from other people so the disease would not spread. If the sores went away, the leper had to go to the priest to be examined. If the priest said that the man was no longer contagious, he could go back and live with his family. Sometimes people got the disease because they had disobeyed God. Miriam, the sister of Moses, got leprosy because she and Aaron, her brother, said that God should be speaking through them as He did through their brother Moses. Once a king got leprosy because he rebelled against God. His name was Uzziah (uh ZIE uh) and he was a king of Judah. At the beginning of his reign, he was a good king, but later he began to disobey. He decided to go into the temple to burn incense to God. Only the priests were allowed to do this, and he was not a priest. He had leprosy the rest of his life and had to live in a separate house. These men called out, "Jesus, Master, have mercy on us!" They knew he had healed others. Jesus told them to go and show themselves to the priests, and as they were going, a wonderful thing happened. Their skin became clean and free from leprosy! We can just imagine the joy they felt. Nine of the men continued on to go see the priest, but one man turned back and came to Jesus. 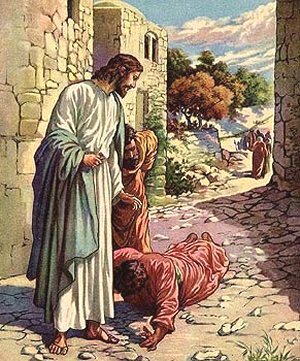 He was praising God with a loud voice, and he fell at Jesus' feet and thanked him. This man was a Samaritan, a man from the region of Samaria. The Samaritans were hated by the Jews. Jesus asked where the other nine men were. Ten were healed, but only one came back to say "Thank you", and he was a foreigner. Jesus told the man, "Rise and go. Your faith has made you well." The lesson we learn from the story of the ten lepers is the lesson of gratitude or being thankful. Only one of the men that Jesus healed came back to thank him. Are you a thankful person? Do you appreciate what your family does for you? They work very hard to provide for you and give you the things you need. Do you thank them, and do you show your appreciation by cooperating with them? At times it is necessary for them to discipline you. You may not be thankful for that right now, but later on in life you will remember it and thank them for it. As a result of their loving discipline, you will have become the person that God wants you to be. 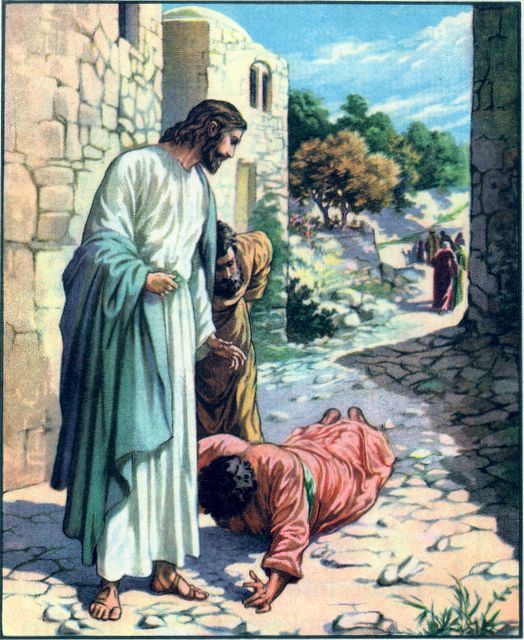 English Bible Activities Select story #212 in the list for activities to accompany this Bible story. Spanish Bible Activities Select story #212 in the list for activities to accompany this Bible story. Am inspired. May your anointing never dry in Christ name. Helped me prepare my sermon today! Jews and Samaritans were not allowed to mix; neither were lepers and healthy. 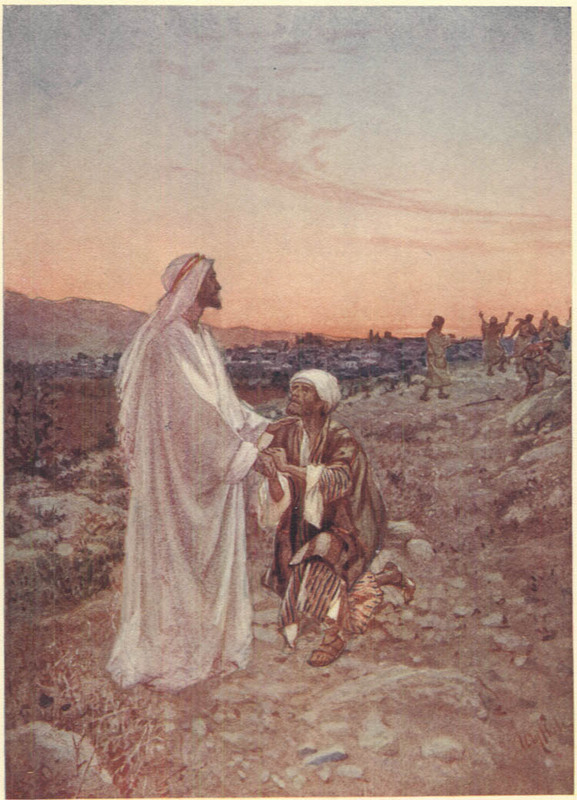 Jesus cured ten lepers; only one came back to thank him, a Samaritan:-lesson one. Lepers mixed:-lesson two. This page displayed 324,796 times.